In this interview I dig a little deeper into the bass playing of Dirty Loops bassist, Henrik Linder! Henrik is a perfect example of what’s possible if you fully explore your instrument. His breathtaking technique and effortless command of his Mattisson 6-string bass has opened up a Pandora’s box with regard to what can be done with a bass guitar. Since breaking onto the scene with Swedish fusion trio Dirty Loops back in 2008, Henrik continues to perform at such a high musical level, that it will blow your mind to hear this brilliant bassist in action for SBL. 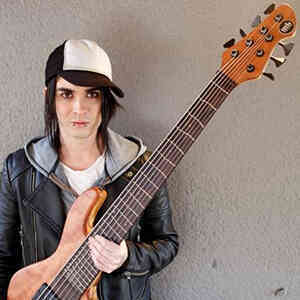 Bassist with YouTube sensation Dirty Loops. All about Henrik’s approach to improvisation. How he got into jazz and jazz harmony. How Flea influenced his slap technique. Check out the lick he stole from Gary Willis! Hear three exclusive performances from Henrik's own trio.